I love the feeling of eating delicious and healthy meals, and in this case I feel like I’m nourishing my body with every spoonfool. 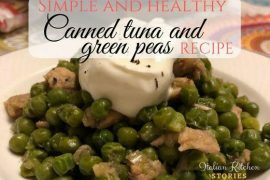 This canned tuna and green peas recipe is so simple and requires only four ingredients that everybody can make it, even the beginner. I usually do it on the nights when I don’t know what to make and when my empty fridge gives me the weird stares. I always have at least one onion 2-3 cups of green peas and one can of tuna. But, if you find yourself preparing the dinner and you find out the last minute that you don’t have canned tuna feel free to substitute it with chopped bacon or previously baked chicken. I like the fact that you can make super tasty dishes with such simple ingredients. The process is super simple, you can even have your kids helping you. So let’s start to chop your onion into small cubes and toss it into your frying pan or in some shallow pot. Sauté the onions adding a touch of salt and stir them for about 2-3 minutes or until you see that they have become nice see-through, then add the green peas and stir. Once you have stirred together onion and green peas for about 2 minutes add the water to cover all green peas. Even better would be to add the vegetable broth. Let the green peas simmer on the medium-low heat with the uncovered pot. Once you notice that the water level has dropped down and that the green peas have become softer taste them. Now it’s a good time to add salt pepper or additional spices that you like. 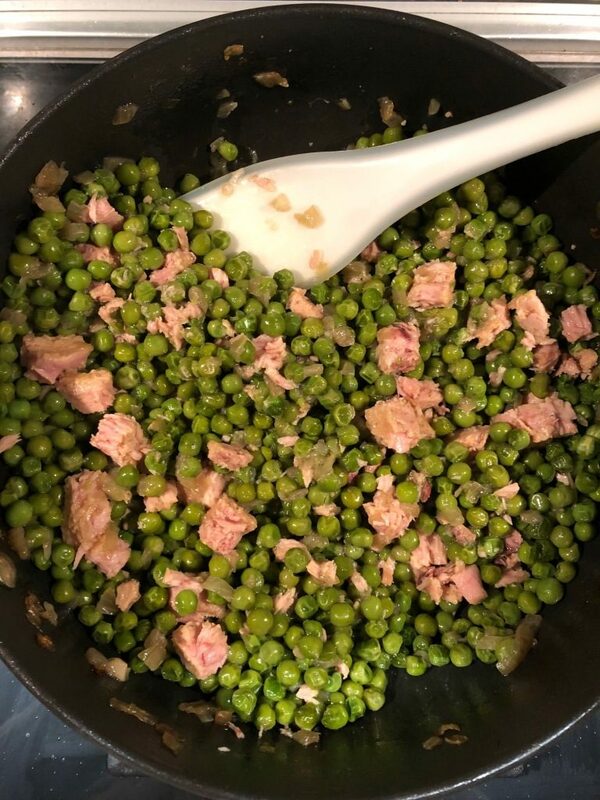 Once you taste the peas and see that they are cooked add drained tuna stirring well all ingredients together. By now the water or vegetable broth have evaporated and you have nice chunks of tuna and green peas mixed together. Your meal is ready. Place it on the plate and I had a nice generous scoop of sour cream. I like to add a touch of salt and fresh ground pepper on top of my sour cream. But you can also add some fresh parsley or basil too. I’m sure you will enjoy this hearty healthy nourishing dish. PRO TIP: Alternative to this yummy dish you can take some green peas squash them a bit with the fork and place them on bruschetta bread. Decorate with the tuna chunks afterward. And this way you can make a super delicious appetizer for the people that desire to try something different. Composed of about 80% water, green peas include carbohydrates, vegetable proteins, fibers, mineral salts, and vitamins. How much protein is in Green peas? This small green pearl contains a high amount of good vegetable protein. In 100 grams of green peas you are served 5.5.g of protein. The B, B1 and B3 vitamins, in particular, bring benefits to the nervous system, ensuring their correct functioning while. The good availability of folates that once in the body will be converted into vitamin B9, prevents depression and bad mood. Green peas help digest and protect from intestinal infections: peas are a very digestible food thanks to the fact that they contain a lower concentration of starch than other legumes, in addition to the high content of insoluble fibers. 100 grams of fresh peas have a caloric yield of 81 calories. Frozen peas retain many of the nutritional properties as fresh ones. The texture changes, which becomes less firm and in the mouth may be more “hollow”, but the taste is very similar to a fresh ones, however, slightly less intense. Green peas are excellent, in particular, with rice. Furthermore, the combination with cereals is particularly useful, as it allows us to obtain all the essential amino acids we need in a single dish. Are peas bad for you? As with other legumes, their consumption can cause digestive problems. Due to the presence of a carbohydrate that is not digested, but is fermented by bacteria in the intestine, peas can cause the formation of gas in the intestine. In other words, there are more positive sides of green peas than the negative ones and we could say that peas are good for you! 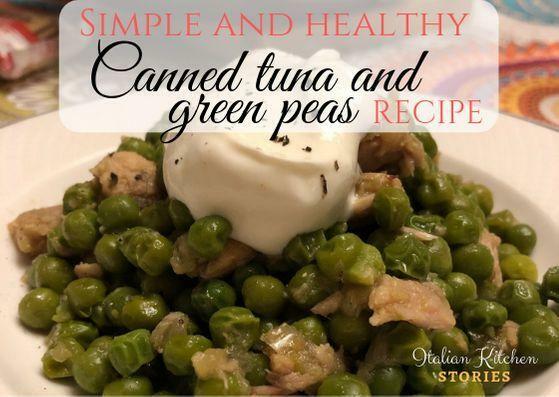 Delicious canned tuna and green peas is the dish you can prepare in 30 minutes. This makes it a perfect and healthy dinner even beginner can prepare. Chop the onion on smaller pieces. Saute the onions over olive oil and sprinkle of salt. Once onions softens add green peas and stir all together. Add boiling water or vegetable broth to cover the green peas. If you are using water add a Knorr cube or your preferred. Cook over medium heat and occasionally stir and add additional water/broth as needed. Give it a pinch of salt and fresh ground pepper. Cook until the peas are soft and then add drained canned tuna. Let the tuna warm up by cooking for additional 3-4 minutes. Serve immediately with a nice scoop of sour cream or Greek yogurt.